The new Acura NSX is a sleek, technocratic exercise in sports car design and engineering. Patience is a virtue. But 10 years is a long time to wait—even for the love of your life. Now, this is not to say that car enthusiasts are so enamoured with the 2017 Acura NSX that they patiently renewed transit passes and religiously wore out shoe leather while waiting for this hybrid supercar to arrive on the market (the previous generation NSX was discontinued in 2005). But this scenario remains a distinct possibility. From the very beginning, the Japanese supercar has been the white whale of the automotive industry, appearing on the horizon from time to time like a hallucinatory episode that quickly fades into memory. The Porsche 911 has been in production for 53 years now; the Japanese equivalent will be lucky to last a decade before the internal pencil pushers make an economic case for discontinuation. Of course, there’s a reason for this dichotomy. Niche manufacturers such as Porsche can afford to be exclusively involved in sports cars of various shapes, sizes, and descriptions; the major Japanese manufacturers are wholly driven by sales volume and use high-performance vehicles as moving billboards to demonstrate what they are capable of, if only they were so inclined. Just consider, for a moment, the Nissan GT-R and the Lexus LFA. The former was an automotive legend before it ever came to our shores. The first GT-R, a modified version of the Nissan Skyline coupe, was available in the domestic market between 1969 and 1974. The successor, another high-performance model exclusive to Japan, was sold from 1989 to 2002. The fact that the GT-R was not easily accessible elsewhere went a long way toward ensuring its mythic status. The current Nissan GT-R, which has been imported to North America since it debuted in 2007, is without question a formidable piece of engineering. Ironically, though, this all-wheel drive supercar falls short in terms of exclusivity because it’s both widely available and relatively affordable. On the other hand, affordability and availability were never a concern with the Lexus LFA. If anything, this exclusive supercar, priced at a minimum of $375,000 U.S., was too exclusive. The car was also very rare because it was built for only two years, from 2010 to 2012, before racing off into the distance. On the surface, the Acura NSX stakes out the middle ground between these two—it’s far less rare than the LFA (in that the NSX has now returned to market), but it’s considerably more exclusive than the GT-R (in terms of price and technological sophistication). But there are intangibles at work here, factors that arguably make the NSX the absolute cult favourite of the Japanese supercar set. The Acura NSX is back on the scene, and once again ready to challenge the established supercars of its time. 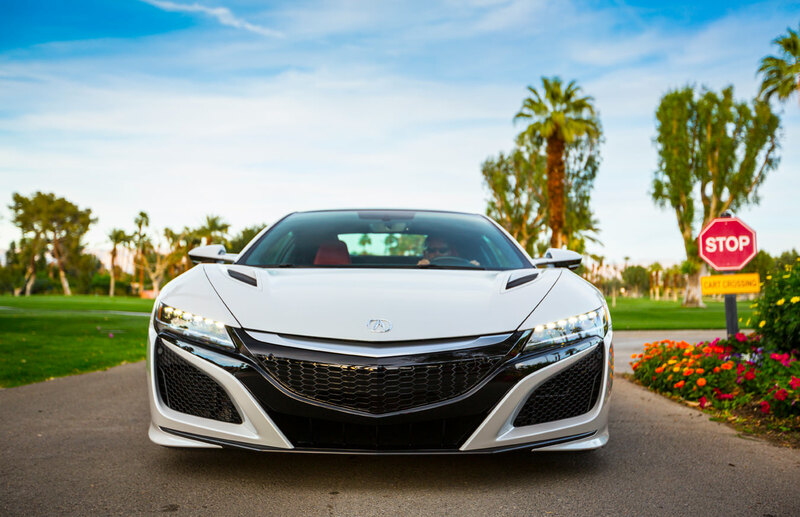 First, there is a tradition of motorsports success at the Honda Motor Co., and this tradition informed the first NSX to a significant degree. The original car debuted in 1990 and, by that point, Honda had become the dominant engine supplier in Grand Prix racing. In 1988, the McLaren-Honda combination set an all-time record by winning 15 of the 16 F1 races held that season. Following that epic year, lead driver Ayrton Senna was called to the Tochigi Proving Ground test facility in Japan to fine-tune the handling of the NSX before it went into production. When the best race car driver in the world has played a role in the development of your car, that’s a level of street cred money can’t buy. The first NSX established a new high water mark for late 20th-century supercars. Prior to its arrival, supercars were notoriously finicky, requiring regular visits to the garage to ensure they were always operating at peak performance. They were also not all that refined or easy to drive, some of them having far more power than the chassis, brakes, or steering could handle. The Acura changed all that. The car’s naturally aspirated V6 engine was reasonably powerful for the time, but not overwhelmingly so. The strength of the car was its neutral handling and ease of operation. Also, as the NSX was a Honda under that caliper-sporting badge, it was incredibly reliable compared to other supercars. By the time the first NSX went out of production, the competition had closed the gap; today, there is no such thing as a modern supercar that doesn’t have at least some measure of “everyday” functionality. This new breed of supercars is also, across the board, far less temperamental than its predecessors. And there’s been another significant development since the era of the original NSX—the advent of hybrid technology that’s used not just to create increased efficiency, but also more speed. So while the original NSX raised the bar for the supercar set, other supercar manufacturers have since moved it all on their own. (Just consider the BMW i8, the Ferrari LaFerrari, the McLaren P1, and the Porsche 918 Spyder—all electrifying performers in their own right.) 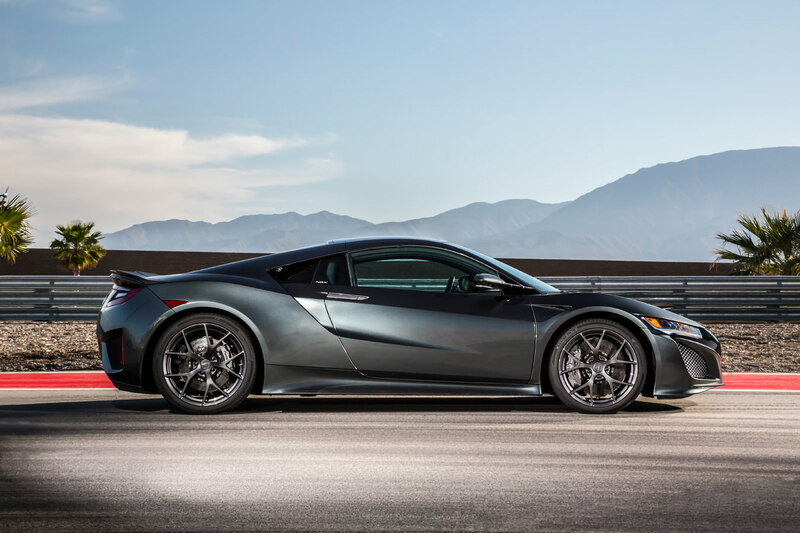 But the Acura NSX is back on the scene, and following an exhaustive development process that saw multiple changes in direction from engineering and design standpoints, it’s once again ready to challenge the established supercars of its time. The engineers at Acura began with the classic modern supercar layout and then applied some creative licence. 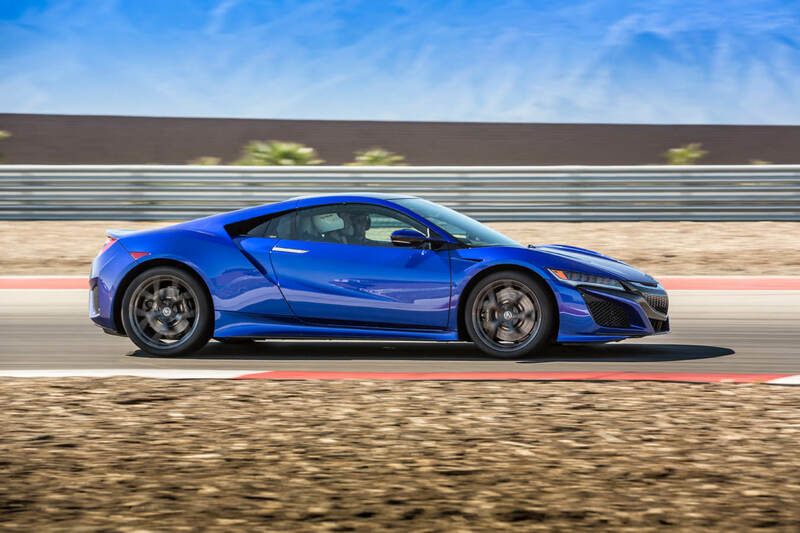 The chassis is constructed with aluminum, steel, and carbon fibre; Acura engineers claim it is two to three times as rigid as its closest competitors in the supercar class. The twin-turbocharged 3.5-litre V6 gas engine is mounted in the middle of the car, right behind the sculpted, leather-ensconced sport seats. The engine sends power to the rear wheels. An electric motor is planted at each front wheel; this not only helps to drive the entire car forward, it also creates a true all-wheel drive system. 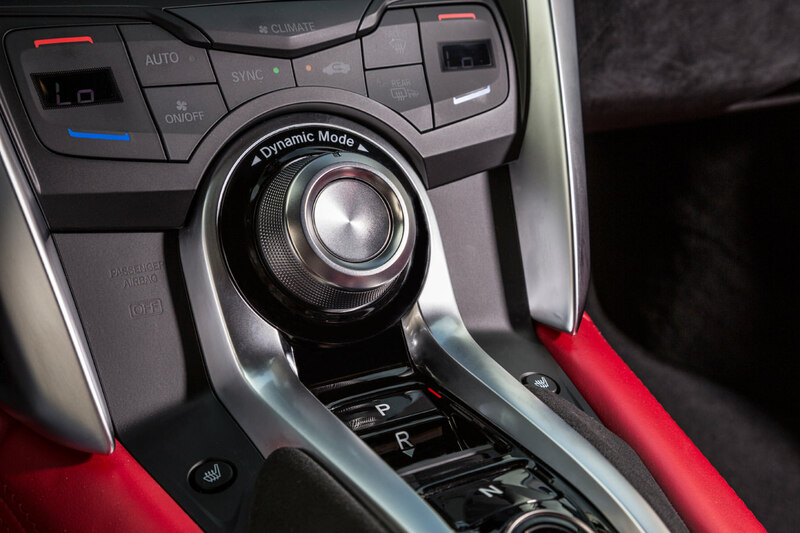 The nine-speed dual-clutch automatic transmission incorporates a third electric motor, which creates what’s called a “torque fill effect,” helping to slash the lag in delivery that’s common in turbocharged engines. When the best race car driver in the world has played a role in the development of your car, that’s a level of street cred money can’t buy. The total output for the gas-electric hybrid drivetrain is 573 horsepower and 406 lb-ft of torque, the latter figure available from very low in the rev range (just 2,000 rpm). If these numbers scream “authentic supercar” to you, you’d be correct. The NSX might not boast the most horsepower or torque in this class, but the net effect is impressive—the dash from 0 to 100 km/h takes some three seconds, and top speed is 307 km/h. Driving the new NSX is a revelatory experience—full stop. There are four different drive modes to choose from: quiet, sport, sport plus, and track. The quiet mode offers all-electric cruising for very brief periods at speeds below 80 km/h. At the other end of the sliding scale, track mode is for all-out attack, drawing on the full resources of the hybrid powertrain. 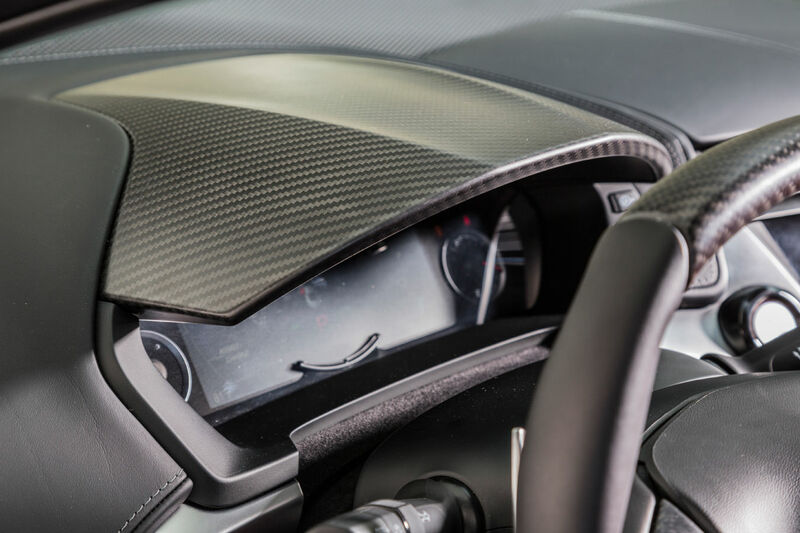 The NSX has an automatic launch control system—no special buttons to push, just press the brake pedal and accelerator to the floor at the same time, wait for a signal to appear on the instrument panel, and release the brake. With all four wheels generating forward traction and the nine-speed dual-clutch automatic left to its own devices, the Acura simply hunkers down and blasts off the line—little wheelspin, perfectly timed shifts, little visual or visceral drama. Away from straight lines, the NSX performs even better—and ratchets up the excitement level at the same time. The Sport Hybrid AWD system pulls off a couple of neat tricks in order to generate more traction and increased cornering capabilities. First, it features a torque-vectoring system that overaccelerates the outside rear wheel to help carve turns more sharply. Next, those electric motors at the front wheels mentioned earlier. They pull the Acura forward out of the corners in a way that the average AWD supercar can’t approach. Back out on the open road, the new NSX has similar levels of everyday driveability to the original, but it arrives at this from a completely different angle. With the drive mode settings dialled in at their most relaxed, the suspension system becomes more compliant, the throttle response is reduced, and the exhaust note takes on a more subdued tone. Only time will tell if the 2017 Acura NSX becomes an automotive icon on par with the 1990 Acura NSX. All the elements are there. The exterior design is bold and striking. The hybrid powertrain is au courant. And the thing is incredibly fun to drive. What more could an erstwhile supercar owner ask for?